Culled from George Ngwane (1993) Bate Besong (Or the Symbol of Anglophone Hope). Limbe: Noomerac Press. Bate Besong is Bate Besong. If you call him Besong Bate, it will be somebody else. His name refuses to obey the law of choice. Born on 8th May 1954 at Ikot Ansa Calabar, former Eastern Nigeria, of Cameroonian parents from Ndekwai Mamfe, Bate Besong (BB) began his secondary education at St. Bedes College, Ashing Kom. While in Kom, his passion for Art was nursed and nurtured as he developed an interest for music, playing in the school orchestra with mates like Kenneth Komtaghi of the "Do Good" fame and earning the show business tag of James Brown (JB). 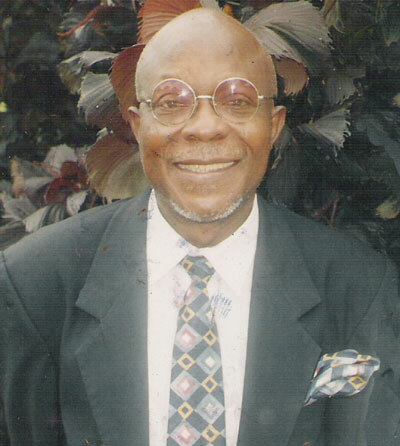 His academic ambition propelled him to the land of literature – Nigeria - where he obtained his "A" levels at Waddell Institute, Calabar, then got a Bachelor’s Degree in English Literary Studies from the University of Calabar, before crowning his academic pursuit with a Masters Degree (emphasis on African poetry and drama) from the University of Ibadan. While in Nigerian colleges, he was more than a hermit, reserving his active energy to the confines of libraries, pondering over text books that have laid bare this continent of contradictions on the map of the world. He was shy, withdrawn to the timidity of his literary imagination to the point that he dulled his own social life either out of brazen unworldliness or obsessed with the trappings and trimmings of a budding artist. If Nigeria was his Gethsemane, where he prayed and got Literary inspiration, the University campus was his Bethlehem. It was simply the cradle of his artistic perception. He saw the world through the prism of paradoxes. Nigeria at that time was the cauldron of military dictatorship and Bate Besong did not sit watching idly. He contributed to Literary journals like Opon Ifa, Okike, Anthology of Oracle Poets, West Africa Magazine, Quest Magazine, Drumbeats and the African Concord. He also acted as a ghost writer for many personalities including the late Mamman Vatsa, edited some of the fine poems of Niyi Osundare and had his first book Polyphemus Detainee and other Skulls launched in April 1980 by the internationally renowned novelist Chinua Achebe. An incredible achievement.A true mentor.one who spends his active energy in libraries.unmaterialistic and identifies himself always with the masses e.g.during the launching of the Achimgbe Trilogy in Amphi 750 of the University of Buea,eaaly 2004,BB was asked by the MC to take his right place at the high table,from the audience.his courage in crying foul where ever there is injustice makes him an epitome of justice.a true patriot who is still yet,but would be recognised by those who know the virtues of conscience. To God be the Glory for his endeavours and achievements. More power to your elbows Dr.B B.Keep up the good writing skills that you have and do as much as you can to be our Wole Soyinka,Chinua Achebe,Ralph Waldo Emerson et al of Cameroon.The pens runs and laughs in your hands and it should always run and at all times deespite the threats that you may have either from the regime of the Njeumas who may want to Njeumamaniac you not to inform the public or leave behind a Legacy that chirubins/Angels will report back to the creator that he did his part of the work. I give you hug for you erudite and clear spirits and will pray you to continue and to bring to Cameroon writers the fame older generations were unable to bring but for Fonlon that you are emulating.You may not be so philosophical as Fonlon but your approach is luring and compelling to all readers of good literature.Keep up your narrative style,for it is the tool that you have to build a mansion with and don't despair for if the fall-out of your sweat are not trigging in.Book reading culture will gradually enter Cameroon and when it shall finally arrive Cameroon you will not regret about what you have in black and white.I will again,wish to advice you,to keep strong copyright of all that you have written so far.this will enable you enjoy fully ripe fruits of your labour and hig sense of writing. Dr.B B Bravo to you and to all Cameroon writers. If there is any one thing English speakers of Cameroon should be proud of,it is nothing but the legacy of Dr.Bernard Nsukika Fonlon.The creation of a Fonlon-Society is not the best we can do,what we as English speaker, proud of what he did,the way he did and how he did all that he did,is to implant a culture of transcendence to young Cameroonians.I will exhort Dr.Bate B. (Beast of no Nation Fame) to continue writing as he is doing but should rather be simple and communicative.His language sometimes is too hard for intermediate scholars or the common man. Those who champion The Fonlon Legacy now,should make available what he left unpublished to the young generation who are desirous to read about this intellectual iconery and strong sight and his communicative philosophies that make us proud.Most of his publications are dog's tears nowadays.I will call on you running in his footprints to make public all that he wrote. I will particularly thank Dr.Bate B for the handling his pen the way he is doing it.let the pen run and laugh in his hands as many times as he can make it possible.It is not good to appeciate somebody as Late Fonlon said,in one of his books that,Appreciation is a form of corruption.I don't want to corrupt the former for the eloquent publications he has to his credit but to give him a pat on his back for doing something in black and white. Not a digression but compliment along the route paved by Dr.Fonlon,Dr.Bate B is running on the right track.I will call on BB as he is fondly called to even too critical about the ills of society and not be afraid to be fired for his opinion.The best way to gain fame is by writing and to castigate what ever ills you see,so that tomorrow will say,there once was a BB who saw what he saw and wrote just what he saw even though was rewarded by torture and threats to life,limb and liberty. I wish to put information about my Gospel CD on your site. I will be glad to receive further information about this. STYLE,STYLE.il miggliore fabbro!thematics aside, i savour ur poetics...the profusion of that verbal alchemy brewed by a maestrochef from the simmering profundities of pots of eclectic rareties and skills,laying the banqettable of our literary famine,erstwhile, with goldmounds of most exotic delicacies paralleled solely with the fetished staple of Soyinka`s cuisine! Truly,u ve, stylistically,been labelled obscurantist;but if it is out of their sloth and mediocrity then it is a literary sin.i conjecture u respect the intelligence of ur public and seek, understandably, to challenge and uplift the intelligence of ur students so they can de equipped with the sophistication enuff to resist the mammoth, heartless compressor-machines of a new,unaltruistic millenium webbed and barbed with hypercomplexities and veneered realities,insuperable by the facile choices! Father BB, MAY God adds your life time on this earth so that through your writings,you succeed in delivring us, young camerounians who have a very dark future and do not know what our corrupted life would be. Juste pour saluer le talent d'un ecrivain qui parle pour le peuple qu'il connait bien, et aussi pour encourager les ecrivains camerounais à suivre son exemple. BB,O BOSO!!!! Je profite de cette occasion pour vous présenter mrs voeux de santé,de bonheur et de paix pour l'année 2005.A vous ,le champion de la justice et de la vérité.Vous ètes un maitre et celui qui dira le contraire est un fouGod bless you.Votre étudiant. c'est un plaisir pour moi docteur,de lire a travers tes chefs d'euvres ton engagement.j'admire votre engagement a critiquer fermement non seulement la societe camerounaise,mais aussi la societe africaine.vous devriez etre un exemple pour les jeunes ecrivains,c'est a dire combatre le vice par tous les moyens.recevez docteur,tous mes veux les plus meilleurs pour la nouvelle annee et que cette annee vous donne plus d'energie pour combatre les dechets qui minent la societe africaine. Sir you inspired me a lot in literature. I am very proud of you. Presently I am working on a novel titled 'The Prostitute who loved me' It will be an honour for me to have you read through my work. Below are my contact No 27729521883. Juste pour saluer le talent d'un grand écrivain et lui témoignerl'admiration que nous avons à son écart .Nous souhaiterons si possible recevoir des conseils de lui en tant que jeunes écrivains passionnés de la litterature africaine et de l'écriture.une bonne fête de pâque à vous cher professeur BB. Great is your name Dr.Bate Besong and excellent are your works.Your wonderful web site speaks it all. Good for reseach,strong cultural values,great personalities of our time, it equally carries lots of historical material and lots of other useful sites which happen to over-lap. Congratulation brother and may success always come your way. JUST LIKE THE FUEL STEAMS THE ENGINE OF A CAR, SO YOU STEAM CRITICAL REASONING WITHIN THE FEW YOUNG CAMEROONIANS WHO ARE BLESSED TO KNOW YOU. WITH YOUR PEN YOU BUILD AN IRONED OUT CAMEROON. JUST AS FLIES SETTLE ON THE TABLES IN "THEIR" OFFICES,SO SHALL THESAME FLIES SETTLE ON THE WITHERED PIECES OF THIER CARCASSES WHEN LEFT TO COOK IN THE SUN AS MEAT FOR STRAY DOGS.WE LOOK UP TO YOUR IDEAL TYPE OF CAMEROON. REMAIN UNBENDABLE! Just to thank and encourage u for the good work u have been doing and to pray to God to grand u long life. thanks for the wonderful work you are doing there in Buea.Though not a student of literature, I have often been proud of you.I love listenning to you. When will we ever have enough time to enjoy our icons? Bate Bessong was one of those the nation came to revere. His abilities have not yet been replicated among our literary universe, therefore his death leaves an enormous vacuum to fill. Bro, Good bye until we one day meet again in another world. It pains to see you depart us so prematurely. The news of Dr. Bate Besong brought shame to the cold hands of death this morning. Yet, death itself did not feel the shame, pretending to not know the harm and loss its taking away Dr. Bate Besong from Cameroon will bring to its people. Dr. Bate Besong, one of the greatest minds Cameron has produced was a great mind that used his pen and intellectual philosophy to fight for the oppressed. We will live to remember and miss Dr. Bate Besong. Did I hear someone say "oh death where is your sting?" BB's death is indeed an extremely painful sting. Till we meet again Master, may God keep you in the palm of His hands.Meanwhile, your fruits live on.Adieu great one. Bate Besong, fondly referred to as 'a writer as a tiger'constituted a symbol of hopes for the culture of anglo-saxon literary education in Cameroon.A critic,poet & playwright has created a big vacuum within the academic family following his untimely death. A fountain of knowledge has suddenly gone dry. What a set-back especially to the down-throdden. BB, It's now that your world view as a prism of paradoxes clearly comes to light. May this big brain rest in perfect peace. That snare at Edea ensnared BB. When will this trap at Edea parole of men of fame,the baobab has fallen,who next? i carry chill in my heart, oh God have mercy and give them eternal rest. That snare at Edea ensnared BB. When will this trap at Edea parole our men of fame,the baobab has fallen,who next? i carry a chill in my heart, oh God have mercy and give them eternal rest. Actually the events of that dreadful day sent shocks of waves into my spine. Bate Besong, the literary critic, who rode the fiery blazing chariot of contemporary ills that set the perpetrators of our present regimes most abominable acts into a state of panic and anguish like a disilussioned and poorly equiped medieval army. And to think that BB had made his last journey with his bossom friend and son, his academic protege Dr Ambe Hilarious heightens Disillusionment. Atleast the son would have stayed on earth, to educate more people on the Besongisms. Does his mean that BB left no trail to continue on his philosophies and literary ideas? i think the answer lies in the hearts of those thousands of students who have been privileged to be thought by another Africa's Wole Soyinka, Chinua Achebe, and Ngugi Wa Thiongo. If his words actually did stimulate the mind and called for a change, then his legacy must be kept aglow. It is disheartening to think that the Cameroon Anglophone literary village has lost a baobab and an Iroko at the time when literary awareness is on the rise. A genuine intellectual campaign which began with Fonlons ABBIA, then slumbered as a result of the overbearing attitude of the French speaking Cameroonians. BB your passing away reminds me of Shakespeares extract from Macbeth. A poor player on stage that struts and frets upon the hour..."
You have gone ahed of us but your legacy would forever remain as a source of our inspiration. Dr Ambe, it is sad to think that you went away so fast with your mentor. If the concept of life was fairly proportionate, then it meant you would have had another life after BB to effectively sow your collective wisdom here on earth. But we are mortals and so cannot question the gods. Maybe you have been called up to other duties of profane literature in the Celestial Academy.